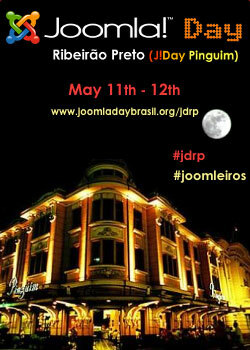 Come join us at the first edition Joomla!Day Brazil Edition Ribeirão Preto, to be held on 11th and 12th May 2012 at the University of Ribeirão Preto - UNAERP. There will be several topics addressed in this first edition in the presence of recognized people between the Brazilian and international Joomla community. We will have talks focused on security, site optimization for search engines, templates and development. Presentation of success cases using the Joomla! CMS, and two "hands on" workshops were we will offer a greater interaction between the participants and the workshop instructors.